The GearWrench Spark Plug Rethreader features extra-long neck for access to recessed spark plug cavities, groove and o-ring holds tool in socket, and use with 3/8'' square drive tool or a 5/8'' socket. GearWrench spark plug insert reamer/tap. GearWrench cylinder head rethreader kit. The 3379D GearWrench 14mm Spark Plug Rethreader is one of thousands of quality tooling products available from MRO Tools. Please browse GearWrench Spark Plug Tools for tools similar to the 3379D GearWrench 14mm Spark Plug Rethreader. 3379D GearWrench 14mm Spark Plug Rethreader description summary: GearWrench spark plug rethreader. 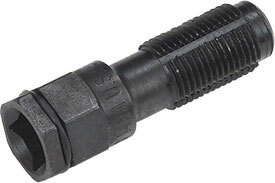 Quantity discounts may be available for the 3379D GearWrench 14mm Spark Plug Rethreader. Please contact MRO Tools for details.